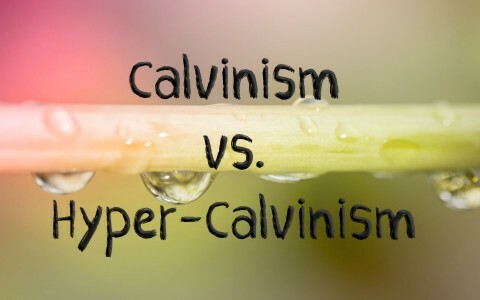 What’s The Difference Between Calvinism And Hyper-Calvinism? Is Calvinism and Hyper-Calvinism opposed to one another? Is one wrong and the other right? John Calvin was one of the early reformers during the period or movement we call the Great Reformation. John Calvin broke from the Roman Catholic Church because he felt much of what they taught was not biblical, like the reliance upon Scripture alone for practices in the church. It is not the church plus tradition and the Scriptures, it is Sola Scripture, or the Scriptures alone. The Bible was the church’s authority and they needed no other. Many saw this as something new, but the truth is it has always been the Word of God as the foundation for all believers around the world, including the structure of the church itself, from pastors to the congregants. Like Martin Luther, John Calvin was a lawyer, meaning he was well educated, but something more than the law captures his heart. I think John Calvin, one of the Reformers, would have been saddened to hear the phrase, “Calvinism” because the Catholic Church usually labeled anything or anyone that differed from their teaching with an “ism.” That label was used for heretics or something that was not true, like Antinomianism, which teaches that believers are not under any obligation to obey the laws of ethics or morality. Calvinism is not strictly his teaching, but what he believes God teaches about the predestinated redemptive plan of God. It is his view on the sovereignty of God. That is best described in T.U.L.I.P. where it talks about the Total Depravity of mankind; the Unconditional Election of those God chooses; of the Limited Atonement, which is sufficient for all, but not efficient for all (who refuse it); God’s Irresistible Grace, where God’s effectual call will be accomplished; and the Perseverance of the Saints, which is better rendered, “God’s preservation of the saints,” because He’s the One Who keeps us. Calvinism is far from fatalism and we’re all helpless victims. That’s more like Hyper-Calvinism, but Calvinism is a doctrine that is founded upon biblical texts and focuses on the sovereignty of God. If I could described my own salvation, would Calvin agree with me saying, “He sought me, He caught me, He bought me, and He taught me what I ought to be? Calvin saw it as God’s drawing us, God’s calling us, God’s saving us, and God preserving us. None of this is about us…it is all about Him, but that’s because He deserves all the glory. I don’t think Calvin would argue with the “it’s all about Him” part. Hyper-Calvinism could be described as Calvinism on steroids. This type of teaching denies the responsibility of man, and takes away the incentive to witness to others because God has already predetermined who will and who won’t go to hell or to heaven. It also denies the “whosoever may come” or “whoever believes” (John 3:16) of the gospel, and so much so that Hyper-Calvinists don’t evangelize. They reason, “Why should we? God’s already appointed all those who will be saved, so why share the gospel?” but this seems to deny the “duty of the sinner” to come to Christ. If a person is not responsible for their actions, then why are there so many Scriptures that say “Whoever believes in Me” (John 11:25)? But if we’re fatalists, destined to sin anyway, how could God judge us? It would seem that Jesus is “kicking against the goads” in the Hyper-Calvinist’s mind by telling His disciples to go into all the world to preach the gospel (Mark 16:15; Acts 1:8). Of course God has determined what will come to pass, but we can’t live like we’re helpless victims of fate, living out history that’s already been written…and living like we know the end already, even before it gets here. We don’t, at least not all of it. Would there be any joy in living like that!? I say, or God’s Word says, we must share the good news and let loose the power of God that is found in the gospel of salvation (Rom 1:16; 1st Cor 1:18). Why would the Apostle Paul ask the church to pray for him that he might be a bold witness for Christ (Eph 6:18-20)? Why would Jesus tell the disciples to go into all the world to make disciples of all nations and teach them the same things Jesus taught them (Matt 28:18-20), if everything’s already been settled? The fact is God will use us as a means to save some, even though He does the saving, but we don’t know who that is, so we must share it with whomever we see. The Hyper-Calvinist would tell us, “You’re wasting your time.” Is it? Or, is it sin not to obey the Great Commission given in an imperative command by our Supreme Commander, the Lord Jesus Christ (Matt 28:18-20)? I would say that every great scholar and teacher and theologian alive has made mistakes (as I have), and there is no one with perfect understanding of the Bible and all its teachings, but is Calvinism true and does it square with Scripture? Was John Calvin right? I would say that we are, as humans, radically deprived rather than totally deprived, because just when someone sinks to a new low in sinning, someone else will double it, so I don’t think any of us could say humans are totally deprived because we do have some good traits, but even when someone’s done the worst, most despicable act in human history, someone else will can along and do even worse. The Bible does teach that we are predestined and chosen by God (Eph 1), sometimes its referred to as “the elect” (1st Pet 1:1-2, 5:13; 2nd Pet 1:10; 2nd John 1:1, 13), and that we are unable to respond without God’s help (John 6:44; Rom 8:29-39; Eph 2:1-2). Calvin also believes in a limited atonement, like the real-life account a prisoner in the 1880’s who was pardoned while on death row. The offer to save his life was his to accept, but it was limited because he refused it and was hanged. The atonement itself is not limited; it is limited because people choose to reject it. Jesus did say that He came to give His life as a ransom for many (Mark 10:45), meaning, certainly not for all. It is enough for all, but not accepted by all, so the offer for eternal life is limited, not by God, but by those many who will not receive it. That’s why the Bible teaches that “many are called, but few are chosen” (Matt 22:14). This election is done by God’s irresistible grace, meaning that it is the Father that draws us (John 6:37, 44), and that means not one will be lost, (John 6:37, 39, 44; 10:28-29). I think people have judged John Calvin too harshly, and maybe it’s because they don’t fully understand what he believed and wrote about. Calvinism is not really a radical departure from Scripture, but I cannot say that I agree with everything he taught, but where we might differ is not going to be over something that a person could risk losing their salvation over. The man devoured Scripture and would have been sick to his stomach if he felt he was doing injustice to biblical teachings. Thanks to Calvin’s work, he helped to stabilize the young Reformation movement by writing his brilliant “Institutes of the Christian Religion” in March, 1536. This book helped support the fledgling movement and helped the reformed Christians and leaders have a ready defense for their faith and a statement of beliefs on the doctrines of their faith. It helped them to focus again on “Sola Scriptura” or Scripture alone, as did the primitive or first century church did (Acts 2:42). That is the foundation upon which Calvin built his beliefs, teachings, and writings upon. Not a bad foundation, is it? Here is a related article for you to read: What is Reformed Theology? Next post: Why Can’t Satan Or The Demons Repent?